Our nation’s capital is home to embassies from around the world, and that includes Mío. The first restaurant to bring Puerto Rican food to Washington, DC, it’s located in the downtown area just a few blocks from K Street, the lobbying corridor. Since it first opened in 2007, Mío has offered island staples such as mofongo, but also dishes such as red snapper with avocado and papaya. Night after night, it packs tables with politicians and their aides, reporters, students, and visitors curious about its evolving menu. 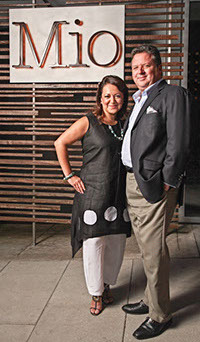 Its founders are Manuel Iguina and his wife Karla, a travel marketing consultant. Manuel has decades of restaurant experience, but he first came to Washington years ago as a George Washington University medical student, and worked in restaurants to earn some extra money. He found that he preferred experiments in the kitchen to ones in the lab. Mío means “mine” in Spanish, but its fans say this means it belongs to one and all. Washington is seeing an unprecedented boom in construction, and neighborhoods that were once ignored are seeing a resurgence, with new residents and new restaurants. The Chinatown-Penn Quarter part of town is nowadays abuzz night and day, but that wasn’t always the case. 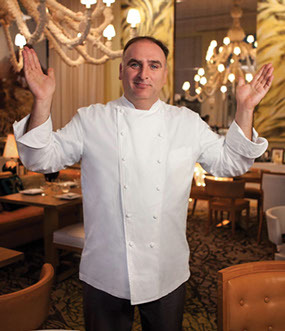 Spanish chef José Ramón Andrés Puerta – better known by his professional name José Andrés – is credited with bringing tapas to the U.S., but it all started more than 20 years ago with his restaurant Jaleo, which is still going strong. Now his inventory includes the upscale taqueria Oyamel, the Turkish-Lebanese- taverna Zaytinya, and the locally sourced, farm-to-table America Eats. His adventurous palate has been so important to the DC restaurant landscape that in 2012 he was named to the TIME 100 annual list of most influential people in the world. “These are people who are using their ideas, their visions, their actions to transform the world and have an effect on a multitude of people,” said TIME managing editor Richard Stengel. Before José Andrés, Washington was known for a few good restaurants that largely catered to the meat and potatoes tastes of lobbyists. For culinary variety and eclectic menus, one had to head north to the Big Apple. But not anymore. “We’re seeing similar quality on par with New York City,” says Díaz. Perhaps no other new restaurant in Washington has created as much of a buzz as José Andrés’ latest, China Chilcano, a Peruvian-Chinese hybrid with a focus on chifa cuisine, created by Chinese immigrants in Peru. The menu might include include lomo saltado, a Peruvian stir fry, ceviche, dim sum, and chilcano, a fish stew. Almost certainly, the bar will serve Peru’s most famous cocktail, the Pisco Sour. There’s also buzz that diners might sample cuy (guinea pig), considered a delicacy in Peru. Not coincidentally, the new restaurant is located near Chinatown. And that’s not all. The city’s most popular chef also has plans to open up a quick-serve restaurant that’ll focus on vegetables (although meat will also be available). Known as Beefesteak, it’ll be located just west of the White House in a new space at George Washington University, where José Andrés happens to teach classes and from where he received an honorary doctorate and served as commencement speaker last year. It’s not just the typical brick and mortar locations that are making a mark in the growing Latino food scene, but also a plethora of food trucks that line up in key locations around the city and surrounding suburbs at lunchtime. Some of the more well-known include Peruvian Brothers, DC Empanadas, Salsa Room Quesadillas & Baked Empanadas, and the Far East Taco Grille. Additionally, there’s the Borinquen Lunch Box, with a loyal following around the Navy Yard and the buildings where the federal agencies are housed. It serves Puerto Rican street food such as alcapurrias and empanadillas. The DC Taco Truck, the DC Pollo Peruvian Food and the Chupacabra Truck with its spicy lamb tacos also have a growing fan base. “Washington has more food variety, more diversity in restaurants, including Latin American cuisine. It’s a vibrant scene and it continues to grow,” concludes Díaz.